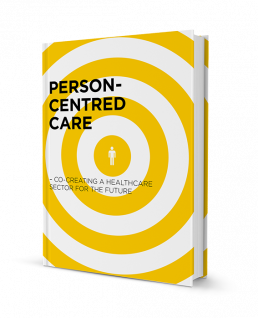 The publication sets out a vision for what healthcare could look like if person-centred care is made a reality for all and is a step on the road to creating health care systems based on partnerships centered around the patient. The guide aims to support this process by focusing on best case practices of solutions co-created by policy-makers, professionals, providers and patients. We completed this project in partnership with DNV GL in 2014. The current system is based on a ‘fix-it’ understanding of healthcare. In much the same way you would call a mechanic if your car broke down, you make an appointment with a healthcare professional – expecting them to locate the problem and then fix it. However, increasing numbers of chronic diseases as well as improved health literacy amongst patients challenge the foundation of the ‘fix-it’ model. A chronic disease, for example, cannot, by definition, be fixed, and so the role of the healthcare professional becomes one of helping people manage their condition. We sought to examine this challenge in the healthcare sector and understand the alternative approaches. This publication advocates for health journeys founded on genuine partnerships, where patients are no longer seen as passive recipients of care and where different stakeholders work together in ensuring the best possible quality of care. This guide aims to inspire and support that process of change by communicating best practice examples of healthcare solutions co-created by policy makers, providers, practitioners and, of course, the health consumer. It gathers existing knowledge, presents best practice examples from around the world, and lets global health leaders shed light on the obstacles to change – and on how to overcome them.